Risotto is my go-to fancy dish. Even though the time required may make it seem overwhelming, trust me when I say that when you've made it once, you've got it down. Every recipe for risotto is practically the same except for a couple of ingredients (unless you're making fritters or cakes). If you're like me, you adore seafood and can eat it pretty much any ol' time. 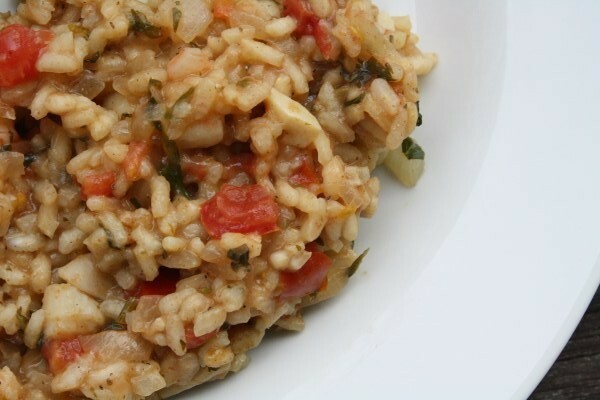 The marriage of seafood and risotto is a perfect combination for me, and I hope it is for you as well. In this particular recipe, I used a frozen seafood mix I bought at Trader Joe's, but you could buy the shellfish fresh or even just include one or two of your favorite types of shellfish. 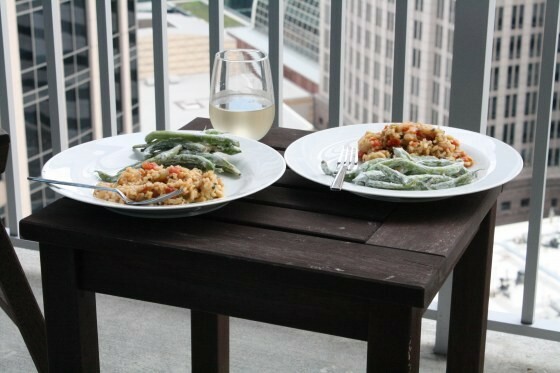 Seafood risotto makes you seem very fancy. Heat 1 teaspoon of olive oil in a large pot. Add onions and garlic and cook until vegetables begin to soften. In the meantime, put vegetable broth in a separate pot and bring to a low simmer on the stove. When onion and garlic has softened, add rice to the pot and cook until a small white dot appears in the center of the rice. Add wine to the pot or rice, onion, and garlic and stir, allowing to cook for about one minute. Add one ladle of broth to the rice and allow to cook, stirring, until broth is almost completely absorbed. Add another ladle of broth and repeat continuously until you have about 1 cup of broth remaining. Meanwhile, heat remaining teaspoon of olive oil in a pan. Add seafood and 1/2 tablespoon of Old Bay seasoning. Cook until seafood is no longer translucent and is cooked through. Add remaining broth to the rice with parsley, tomato, and remaining 1/2 tablespoon of Old Bay. Add salt and stir. When broth is completely absorbed, add seafood to the rice and stir. Top with butter and stir until it is completely melted and mixed throughout. Trader Joe's seafood mix is one pound of shrimp, bay scallops, and calamari. Feel free to substitute with 1 pound of your favorite shellfish. Kelly Davis is a blogger, freelance writer, food enthusiast, and native North Carolinian. When she's not training for a race or cooking something delicious in the kitchen, she's writing, reading, snuggling her dachshund, or plotting her next project. You can keep up with Kelly's antics and recipes on her blog, Foodie Fresh.